Eteponge wrote: According to the eyewitnesses of the Rendlesham Forest Incident (the most famous UFO incident in UK history), the occupants in that specific case identified themselves as Time Travelers. There are Remote Viewers who have picked up via Remote Viewing sessions that certain other UFO type incidents may be as well. Also, research the Double-Slit Experiment and the recent Oxford Study released last year which mathematically proved Many-Worlds Interpretation. During the interview he mentions, on record, the incident where he was missing for 25 minutes, and the later hypnosis session, being revealed to him during the missing time that they were time travelers, and that Sgt. Jim Penniston also underwent hypnosis and was revealed the same story. These two witnesses were the main ones involved. Everytime you see a History Channel program or TV Program on the incident, those two individuals are the main ones interviewed. "Penniston explained he received information after touching the craft’s symbols that chromosomes were gathered for different reasons, particularly to help the time travelers because they have a “physical problem” and Penniston felt sympathy for them. Penniston said the time travelers have Quote: “been coming here for a long time, at least thirty or forty thousand years, trying to sustain their children in the far distant future of Earth." A few weeks ago, John Burroughs and Sgt. Jim Penniston started a group on Facebook, called "Justice for the Bentwaters 81st Security Police at Rendlesham Forest 1980". Both men are on Facebook. You could send them a message and ask further information about it. I would suggest sending a PM to both men on Facebook, simply to inquiry further about this specific aspect of the incident. They can be found via the Facebook Group I mentioned. Let me ask a question. Should I believe testimony from the time of the incident or 30 years later? I know that if I suggest that ol' Jimbo's remarks are a bit...embeleshed...over the years then I'll get told I'm a typical skeptic, but seriously, which one should I believe? At the time of the incident or just before he goes public with his Facebook page? ProfWag wrote: Let me ask a question. Should I believe testimony from the time of the incident or 30 years later? I know that if I suggest that ol' Jimbo's remarks are a bit...embeleshed...over the years then I'll get told I'm a typical skeptic, but seriously, which one should I believe? At the time of the incident or just before he goes public with his Facebook page? John Burroughs underwent hypnosis in 1988, and Jim Penniston underwent hypnosis in 1994. Both were unaware that the other individual underwent hypnosis, and both were unaware that their stories were consistent and match (regarding the occupants being time travelers) until over 20 years later. 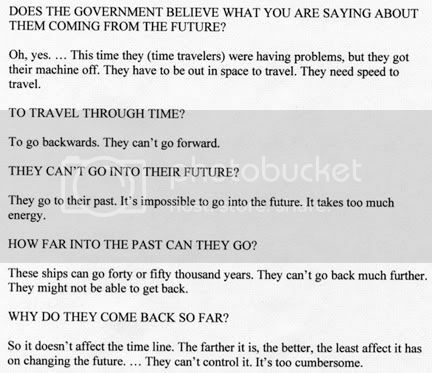 I would suggest just asking them about the time travel aspect, not bothering to play skeptic on them, because they may not respond then. As I have mentioned numerous times, I have personal, first-hand information on that incident, however, I am not going into further details of my knowledge at this time. I can honestly say that this is the first time I had heard of a hypnosis session. Also, unfortunately, I am not very interrested in contacting them via Facebook at this time as to me, that sounds like a publicity stunt rather than an honest investigation. I would rather look at facts and testimony from that time-frame. However, eventually, I may write with questions. I will say this in the meantime (and if you're familiar with this event then you'll know what I'm talking about). I can assure you that there is not one active duty Security Policeman in the Air Force with more than 1 day on the job that writes twenty minutes after midnight as "12:20." Not one. ProfWag wrote: As I have mentioned numerous times, I have personal, first-hand information on that incident, however, I am not going into further details of my knowledge at this time. I can honestly say that this is the first time I had heard of a hypnosis session. Also, unfortunately, I am not very interrested in contacting them via Facebook at this time as to me, that sounds like a publicity stunt rather than an honest investigation. Asking the individuals involved for their full side of the story = publicity stunt? Sounds more like honest investigation to me, go straight to asking the source rather than going by second and third hand accounts. ProfWag wrote: I would rather look at facts and testimony from that time-frame. However, eventually, I may write with questions. 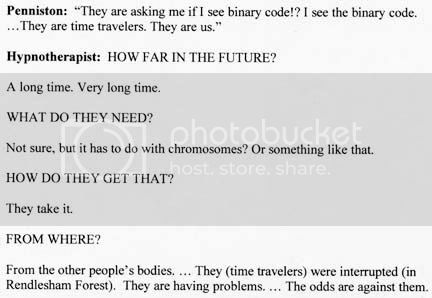 Considering that neither man had recall of those particular events (missing time) until the later hypnosis session, you're not gonna find anything in the initial reports regarding mention of time travel. Sgt. Jim Penniston sketched the craft and touched the symbols, that's in the original reports, and John Burroughs and another cadet approached a blue craft, and according to John and the other eyewitness, he was gone for 25 minutes. ProfWag wrote: I will say this in the meantime (and if you're familiar with this event then you'll know what I'm talking about). I can assure you that there is not one active duty Security Policeman in the Air Force with more than 1 day on the job that writes twenty minutes after midnight as "12:20." Not one. If you are questioning John Burroughs and Sgt. Jim Penniston as frauds, you will fail, because they were both stationed at Bentwaters at that time, that is historical fact, they were both in the original reports, and were eyewitnesses along with Colonel Halt. I am not questioning that they were there as I know for a fact that they were. Do a search for Jim's notebook and see what you find. I'll be honest with everyone here, I haven't researched this case much in the past 10-15 years as this was a closed case for me a long time ago, but to be fair to Indiglo since this is the case he claims has the most evidence for ET, I'll check it out again. UFO's by conflating all these things, ufology loses a lot of credibility and seems completely credulous. in need of evidence. They need to be dealt with separately and not confused with ufos. a UFO then, but it is other phenomena mistaken to be a UFO. no history before the split. not entangled is consciousness itself which is what allows the collapse to take place. I think we need to be very careful not to confuse UFO's with other paranormal things. Indigo Child wrote: To be honest I do not like many worlds interpretation, because it is bizarre and illogical. It suggests that the universe actually splits into a copy of itself with every choice we make. This leads to the absurd conclusion that the copy-universe only begins to exist from the moment we made the choice and did not exist before it. Thus one universe would be the original with a full history before the split, and another universe would be a copy with no history before the split. For many years the physics community has contemplated the existence of alternate realities, or universes other than our own. The idea of multiple universes commonly occurs in discussions of quantum mechanics, and was originally proposed by Hugh Everett in 1956 (the so-called "many worlds" theory) as a possible explanation for experimental results involving the "two-slit experiment." But until now, no one devised an experimental approach to test for the existence of these multiple universes. Beginning in January of 2009, a group of remote viewers utilizing three separate methodologies (CRV, HRVG, and SRV, later expanded to four with TDS) began an experiment designed by Dr. Courtney Brown that directly tested for the existence of multiple universes while using remote viewing to predict future events. This project remains an exciting and landmark opportunity to see remote viewing in action within the context of an important scientific study that has profound implications to our understanding of physical reality. As with many of our studies, this project involved public participation. We encouraged web site visitors to watch the study unfold as the weeks and months proceeded. There has never been a need to "believe" anything with any of our experiments. We simply want people to look at the results, and learn. Something I do find ironic though, Indigo Child, is how much you refer to Michio Kaku in support of things you say regarding string theory and other dimensions, and yet, he is a VERY STRONG supporter of Many-Worlds Interpretation and Time Travel. He's on my side on that, lol. I am certainly a great admirer of Kaku, but that does not mean I accept eveything he supports. many word interpretation was a desperate attempt. as part of our observable universe. Much less use it positively to explain UFO's.